The Best Process Server in Phoenix AZ! Superior Process Services, Inc is a process server Phoenix company and an Attorney/Collection support service dedicated to providing professional services at an affordable rate to both individuals and corporate accounts. Our specialty is process serving, in addition, we also provide various services such as attorney support services, records research, on-site document scanning, investigating and skip tracing. Look no further. 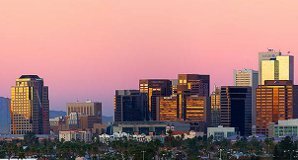 We have over 20 years of process serving experience in the Phoenix metro area including all of Maricopa & Pinal counties. When you need a reliable, dedicated, process server in Phoenix, Scottsdale, Mesa, Tempe, or any other Pinal or Maricopa County City, then feel free to give us a call at (480) 420-0877! Our goal is to provide you with a trusted and competent solution at a great value. Our Arizona-based company will provide you and your firm with the latest technology available coupled with an unparalleled level of customer service. With a dedicated staff and over 20 years of experience, you can be confident in knowing that you have chosen the right Arizona Process Server to complement your business. Consider us an extension of your office! Call (480) 420-0877 anytime between 7am – 8pm! Keep Track of your Projects! Corporate clients can check the status of their service request by logging into our proprietary online software. Our proprietary system allows for clients to access everything from request status to accounting details and everything in between. All clients will receive a email notification with an attached declaration of service upon completion of service. Click Here to check out our reviews on big Google. Get your Papers Served Fast! Defendants dodging your papers? 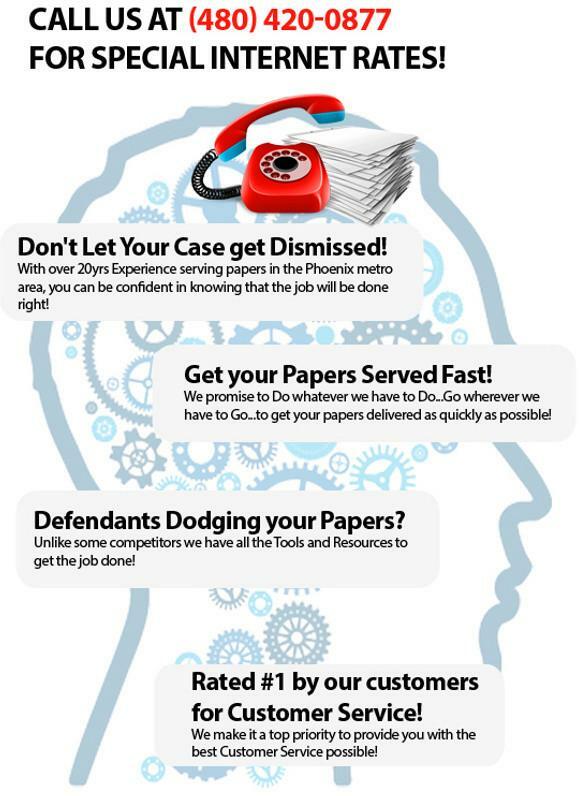 Unlike some process server phoenix competitors, we have all the tools and resources to get the job done! Best Customer Service in Arizona! Rated #1 by our customers in Customer Service! We make it a top priority to provide you with the best Customer Service possible! Your full-service Phoenix Process Server! Process server is one of those jobs that we’ve all heard about but many of us don’t know exactly what they do. Our only introduction to the career is through television. You know, your favorite sitcom character is joking around with some stranger when all of a sudden a batch of papers is shoved in their face and they’re rudely told “you’ve been served.” The character’s face grows long, and he or she walks away, and the audience (laugh track) roars with laughter. Is that really what a process server does? A process server in Scottsdale, AZ, or anywhere in the United States for that matter, is basically a messenger. They notify people of their constitutional rights to due process of law. Yes, that’s right, process servers are a result of the fifth and sixth amendments of the U.S. Constitution. That’s pretty cool when you think about it. Long ago, county sheriffs served process. As jurisdictions grew and crime increased, sheriffs became too busy to deliver court papers. To ensure that these important papers were delivered in a timely fashion, and in accordance with the law of the land, the job of process server was created. It should be noted that some states still require a sheriff, or similar law enforcement officer, to serve process. A process server does more than just hand people court papers. They also file court papers and retrieve documents. Still, serving legal documents is their most important task because if it’s done incorrectly the case could be thrown out of court. In Arizona, the process server gives the individual two documents, a summons and a compliant. Unlike what we usually see on television, the document does not have to be put directly in the hands of the person being served. The server can leave the legal documents at their residence or with their lawyer. Now that you know what a process server Phoenix does you might laugh the next time you see one on TV. Not so much at the intended joke, but at the fact that the show knows very little about what they actually do.